I generally enjoy ted talks, and this was no exception, and yet, I'm always skeptical of new paradigms - more so when they have names and gurus. Unfortunately, I don't think he has anything of use to say. If you've just watched the above video, I'm sorry to have wasted your time. There's always a lack of scientific rigour with gurus. You only hear about the success stories, and that can give you unrealistic expectations for your own kids. However good at parenting you are, you'll have your darker moments. The thrust of it is that families should have meetings, appraisals, mission statements, checklists, etc. The families split into groups to accomplish tasks. The idea is that the home becomes more like the work place. "There's only 10 minutes of productive family time in any meal" Is there really? He then postulates that breakfast only takes 10 minutes, and so you can have your family time then. My counter theory is that the 'productive' 10 minutes is unlikely to be at the beginning of the meal - people (i.e. kids) are more inclined to say what's on their mind after a silence. "My wife and I move where we sit for disciplining the children." "At our family meeting we voted on 'over reacting'..."
We don't have family meetings - we talk about whatever it is, at the time it comes up - or shortly after if someone's having an over reaction. He says that kids who know more about where they come from i.e. where their grandparents were born were more likely to feel confident and well adjusted, and knowing a lot of those things is "the single biggest predictor of emotional health and happiness". 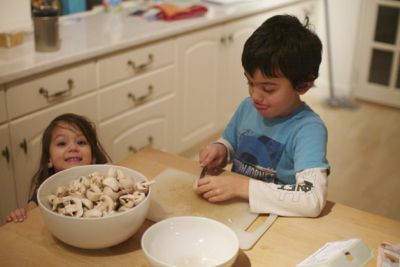 It seems likely to me that kids who know that sort of stuff haven't been drilled by parents who've read of a new parenting paradigm; they've simply spent time chatting to mum or dad while they chop vegetables, shave, or drive in the car. Being able to chat with your parents must be correlated to self esteem, no? What I took from this video, more than anything, is that it's kind of tragic that some parents seem to be so uncomfortable at home that they need to structure it like a work place.